for $77,500 with 2 bedrooms and 2 full baths. This 1,156 square foot home was built in 1994 on a lot size of 0.10 Acre(s). 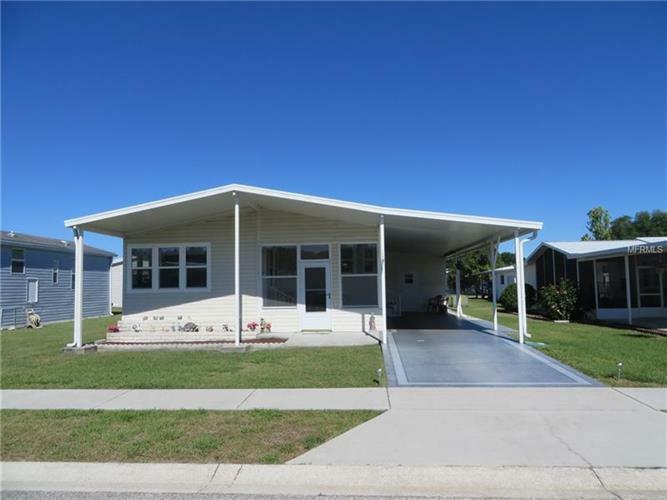 This 2 bedroom, 2 bath furnished double-wide mobile home would make a nice winter getaway from the cold north or year-round residence. As you enter the home you have your kitchen to the left and dining room to the right that leads to your spacious living room with vaulted ceiling. This leads to your Florida room for added living space which also gives you access to your screen room to enjoy when the weather permits. The master bedroom has an en-suite bathroom with a shower. On the outside you have your large storage room at the end of carport that also houses the washer and dryer. The roof was replaced in 2010 and the air conditioner in 2013 per the seller. One added bonus of this home is that it has all double pane windows except in the screen room. This home is located in Terrace Park, a registered 55+ community that has a clubhouse, pool, and shuffleboard with a variety of activities for your enjoyment. Call for your tour today.